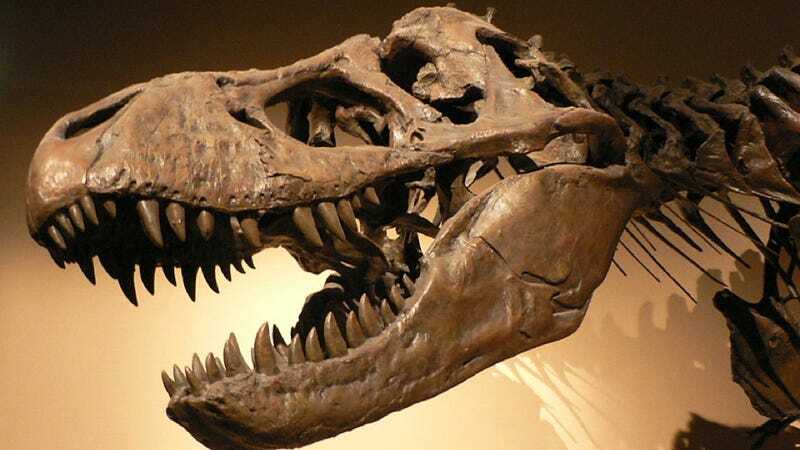 An international team of researchers has used three-dimensional laser scans to determine that Tyrannosaurus rex were likely 30% more massive that we once thought — and a whole lot hungrier. Be honest, now...how many of you woke up this morning thinking you'd hear the words "three-dimensional laser" and "Tyrannosaurus rex" used in the same sentence? Researchers used the scanning technique to generate three-dimensional, digital computer models of five T. rex skeletons. The team then added flesh to the digital frameworks, using the soft tissue structure of birds and crocodiles as a reference point, to estimate how much these massive predatory dinosaurs would have weighed. The team concluded that "Sue," the world's largest and most complete T. rex specimen, would have weighed in excess of nine tons, 30% more than previous estimates. But the researchers' computer models also showed that smallest (and, presumably, youngest) of the specimens would have weighed less than previous estimates, suggesting that, during periods of peak development, T. rex would have grown about twice as fast as we once thought. "At their fastest, in their teenage years, they were putting on 11 pounds or 5 kilograms a day," said John Hutchinson, professor of evolutionary biomechanics at London's Royal Veterinary College and first author on the paper describing the researchers' findings, published in yesterday's issue of PLoS ONE. "Just think how much meat that is. That's a hell of a lot of cheeseburgers...it's a whole lot of duck-billed dinosaurs they needed to be chowing down on."